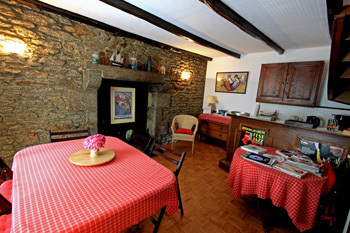 Les Glycines, luxury ensuite bed and breakfast and town amenities in Huelgoat, Finistere. We have three comfortable bedrooms (2 double and 1 twin), all of which have ensuite shower rooms (shower, wash-basin and toilet). 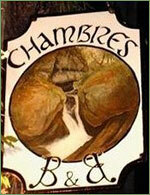 The rooms are traditionally furnished with plenty of storage, central heating and double glazing. 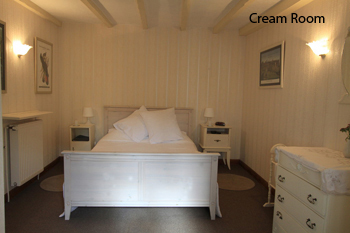 The White and Cream Rooms are both doubles, comfortably and charmingly furnished and located on the first floor of the house. Both have built in wardrobes with plenty of hanging and storage space and alarm clocks (if needed!). Fans are provided in the summer. 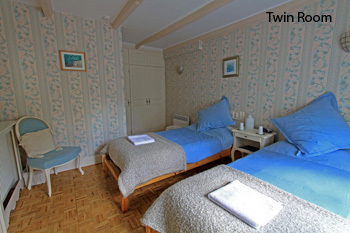 The Twin Room is on the ground floor, with just two small steps from the road to the house entrance, offering easier accessibility for those requiring it. It also has built in wardrobes with plenty of hanging and storage space and alarm clock. Again, a fan is provided in the summer. Located on the ground floor, breakfast is served here but is available for use at any time to relax with a book or browse through the local information available. 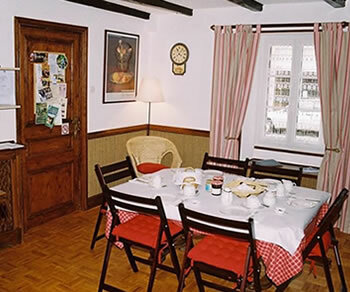 You are also welcome to help yourself to tea and coffee at any time with trays to take it to your room if desired. Thanks to Françoise Brunet for her photographic input.